Vanda Coatings specialise in spray painting commercial architectural metalwork, but occasionally we take on board large domestic projects. We carried out UPVC window spraying in Welsh St Donats in the Vale of Glamorgan on a private property. The owners of this very large cottage had modernised their home and all the windows had been replaced with UPVC frames two or three years ago. Unfortunately, they had all completely discoloured, so Vanda Coatings were called in to bring them back to life by re-coating them in the original colour. 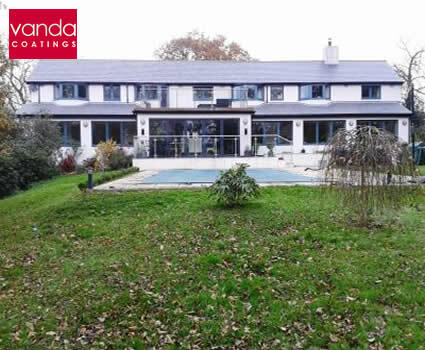 This private domestic job seemed straightforward enough as our professional operatives are experienced in spraying curtain walling on office blocks, hotels and an enormous range of commercial buildings. There was, however a slight sticking problem. In their bid to make maintenance as efficient as possible the owners of Heather Cottage had covered the building in self-cleaning render. This was a great idea for keeping the exterior of the building clean, but it made masking very tricky indeed. The Vanda team needed to mask off the render surrounding the window frames to protect them from overspray. Unfortunately, the fine powdery surface not only deterred dirt from adhering to it, it also meant various types of adhesive tape would not stick to it either. Duct tape is renowned for effectively sticking to most surfaces, but not in this case. Luckily, our Site Manager trawled the internet and found a render tape that was specifically designed for this type of surface and the UPVC window spraying was successfully completed in Welsh St Donats in the Vale of Glamorgan.